← Leonard. For The Win. 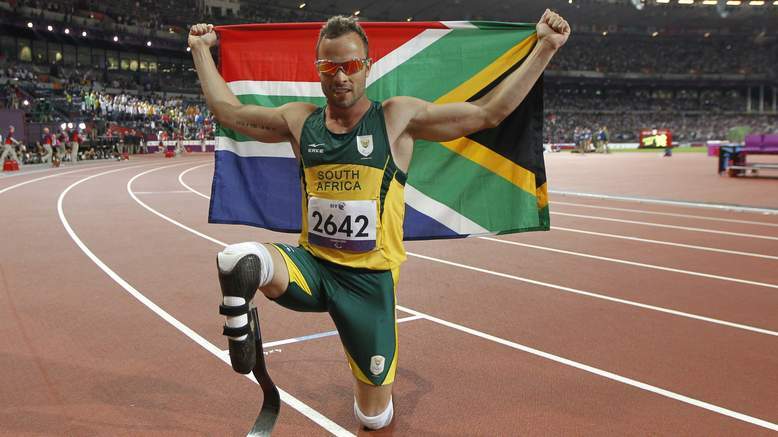 South African blade running Olympic extraordinaire, Oscar Pistorius, has shot and killed his girlfriend, Reeva Steenkamp, in his home. What. Reports are saying that he’s in custody for murder, and that when she woke up early in the morning to surprise him on Valentine’s Day. He woke up, thought she was an intruder, and shot her in the head and arm. That’s multiple shots, folks. In the head? That’s a kill shot. An intruder, huh? Oh, man she had posted on Twitter about Valentine’s Day. Something is obviously fishy here. He either murdered her, or there’s something he’s not telling us about this mistaken “intruder” argument. I’m not a gun guy, so maybe you guys can help me out here. To those of you that have guns in your house, ready to shoot intruders… is it normal to shoot insanely hot supermodels? Is it normal to not give out a “stay right there! I’ve got a gun!” warning? Is it normal to wake up, not see the person that was laying next to you in bed, get up, and shoot that person? This is so confusing. So fishy. She’s a gorgeous supermodel, how do you think she’s an intruder worthy of a kill shot to the freaking head? You’ve got some serious ‘splaining to do, blade runner boy. Accident or not, prayers to Reeva’s family. How awful. This entry was posted in News, Olympics and tagged blade runner murder, did Oscar Pistorius murder his girlfriend?, Reeva Steenkamp, who is Oscar Pistorius girlfriend?. Bookmark the permalink.